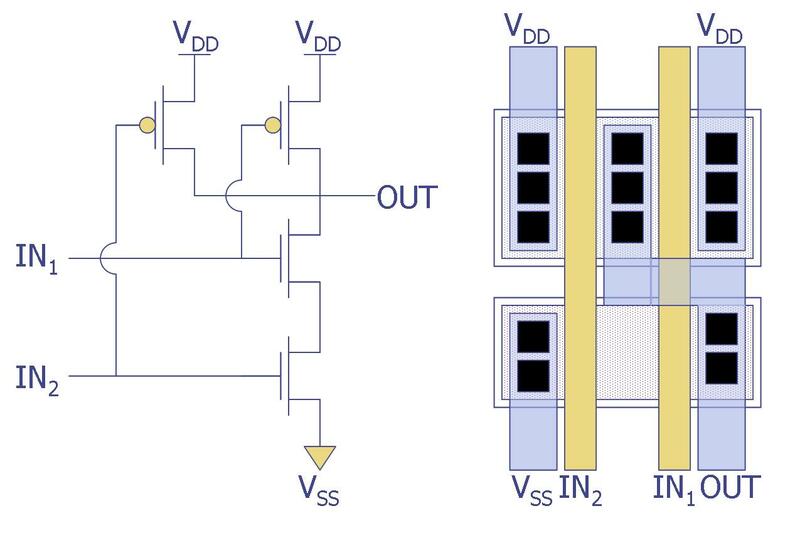 The most common approach to IC layout is the standard cell approach. This involves creating a library of cell layouts for particular functions. In this example, we show a 2-input NAND gate. The schematic is shown at the left and the corresponding layout is shown on the right. In a standard cell design, all of the cells are designed to fit into channels. Therefore, they are all designed with the same height or pitch. The width of the cell might vary in order to accommodate all of the transistors needed for the gate. Most standard cell libraries consist of 30-60 basic logic gates, such as AND gates, NOR gates, flip-flops, inverters, etc. The metal and polysilicon interconnect are laid out such that the gates take up a minimal amount of room. Rows of standard cells and adjacent routing channels for wiring allow one to build up more complex functions. This layout is automatically done by layout synthesis tools. Semitracks, along with Semiconductor International, have put together a three-day course on Semiconductor Process Integration for CMOS and BiCMOS Technologies. Dr. Badih El-Kareh, an independent consultant, will give an overview of the process integration challenges associated with today's advanced semiconductor devices. Dr. El-Kareh will cover passive and active components, contact and interconnect issues, isolation technologies such as STI and SOI, transistor integration issues, as well as full CMOS, BiCMOS and high speed bipolar process integration techniques. To learn more, click on the link below to visit the course page.